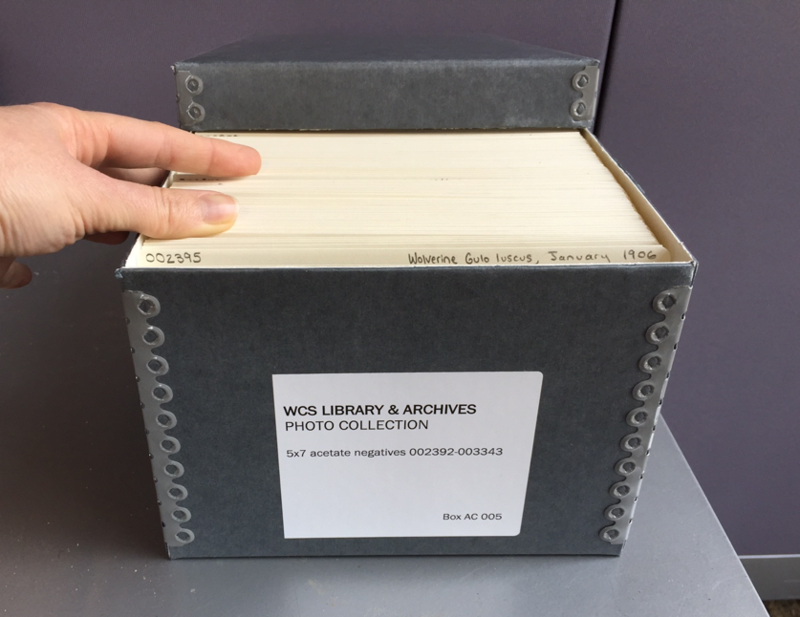 As we’ve been reporting, the WCS Archives has spent the first half of the year working on a project to preserve our photographic negative collection. Funded by the New York State Program for the Conservation and Preservation of Library Research Materials, the project serves as the first phase in what we intend to be a larger initiative to preserve the entire collection. During this first phase, we identified and rehoused the collection’s first 10,267 photographic negatives. This included 2,111 dry plate glass negatives and 8,156 acetate film negatives; of these, all of the glass negatives and 60% of the acetate negatives were 5×7”, and 40% of the acetate negatives were 4×5” or smaller. 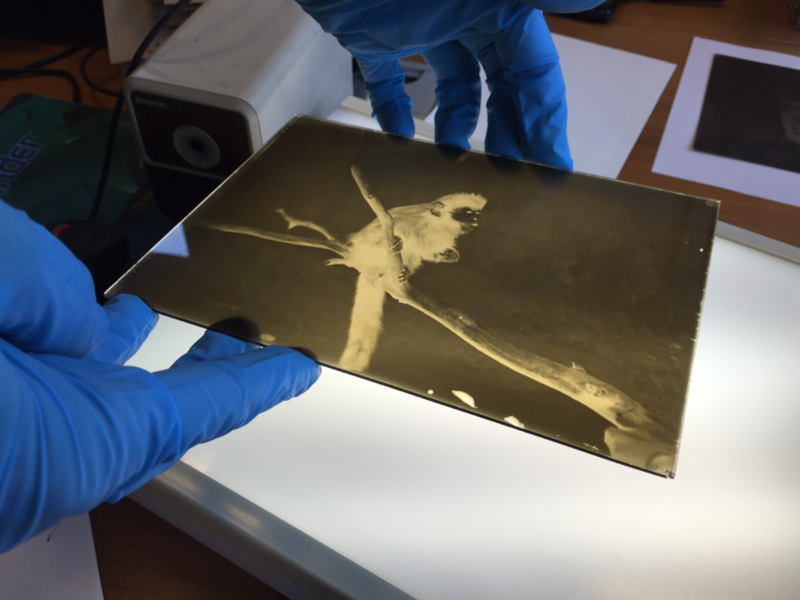 A project intern places a glass negative on the light box for examination. The work was performed by two interns, Savannah Campbell and Marina Obsatz. (You can read Savannah’s reflections on her work here; a post from Marina is forthcoming.) The interns followed guidelines created by the WCS Archives according to each negative’s type and its condition. Glass negatives with no or little deterioration were cleaned by lightly dusting the emulsion side with a soft brush and lightly wiping the reflective side with distilled water and a microfiber cloth. 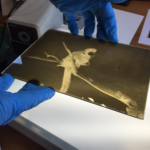 If the glass negative showed signs of significant flaking on the emulsion side, only the reflective side was cleaned (to avoid exacerbating the flaking). If the glass negative were broken or showed signs of or weeping glass, the negative was not cleaned. Acetate negatives were dusted only in rare cases where they appeared visibly dusty; cleaning otherwise was not necessary. Should the WCS Archives eventually digitize these negatives, as we hope to do, the acetate negatives may be individually dusted at that time. A set of acetate negatives at home in its new box. All negatives were rehoused in new envelopes (buffered negative envelopes without thumbcuts for the acetate negatives and four-flap enclosures for the glass negatives), and the negative’s identifier, title, and date were transferred to the new envelope. Glass negatives were placed in padded glass negative barrier board boxes with handles, and acetate negatives were placed in photo barrier board boxes. All boxes were labeled with their contents, and boxes with glass negatives also included the label “Heavy! Glass! Fragile!” to alert anyone retrieving the boxes to their special contents. Additionally, any broken glass negatives as well as film negatives showing severe signs of deterioration, including negatives showing signs of inactive mold, were segregated into separate boxes to avoid contamination of other negatives. Acetate negatives in stages 4-6 of deterioration (as explained in this NEDCC Preservation Leaflet) were considered to show severe signs of deterioration. For each negative, the interns used a shared Google spreadsheet to verify (and, when needed, add to) already existing identifier, title, and date information, and to record information about the negative’s type, condition, and location. Negatives spreadsheet with data entered by interns. There are approximately 48,000 negatives in the collection in total. This first phase has provided us an excellent basis for the project as we seek out funding to rehouse the rest of the collection and eventually to digitize it. In the meantime, we’ve been digitizing some of the negatives as they are needed, and we look forward to sharing those with you here and on WCS’s Wild View blog.